For three weeks in April, I put my entire life on hold to trek in the Khumbu Region of Nepal. As a part of Expedition Hanesbrands, a major mountaineering initiative led by Canadian climber Jamie Clarke, I trekked for more than a week to reach Mount Everest Base Camp. The 17,500-foot tent city, which sits in a glacial field at the base of the world’s tallest peak, would serve as the launch pad for the climbers’ lofty 29,035-foot goal in the sky. Though I was officially working — I was hired as the communications director for the first leg of Expedition Hanesbrands’ climb — the trip followed a similar trajectory that trekkers traditionally take to reach Base Camp, including a flight from Kathmandu to Lukla, and then eight days of hiking uphill village to village to acclimate to the increasingly thinner air en route to Base Camp. Between my duties of blogging, posting videos, and shooting photos for the expedition’s web site, Climbwithus.com, I had time to do day hikes, climb an 18,600-foot peak near Base Camp, and hang out with local Sherpas in lodges and tents along the route. In mid-April, I stumbled into Mount Everest’s Base Camp, a slight altitude headache accompanying me to my tent in the middle of a sea of ice and jumbled stone. Climbing Mount Everest is an obvious achievement. But just trekking to Base Camp is a feat that requires strong lungs, leg muscles that can go for hours uphill, and a physiology that will adapt to air that suffers a significant deficit in the oxygen department. Altitude, not distance or terrain, was the main hurdle on my journey. 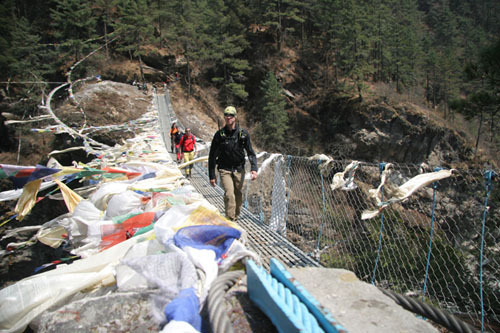 The trek began at about 9,000 feet in the village of Lukla. It topped out at Base Camp with stops to sleep at 11,000 feet, 13,000 feet, 16,000 feet, and higher along the way. Trekkers sweat and breathe hard on the trail, the thin air resulting in headaches and fatigue. You move slow. You stop often. In some villages, a planned rest day keeps you at the same lodge for two nights in a row. The right equipment keeps you going. For gear, I used mainly common backpacking items, including a mid-size pack and trail-running shoes, not boots, most of the way. One thing I did not bring, a dust mask, is highly recommended. Trekkers, porters, and yaks kick up clouds of dust on the dry trail. 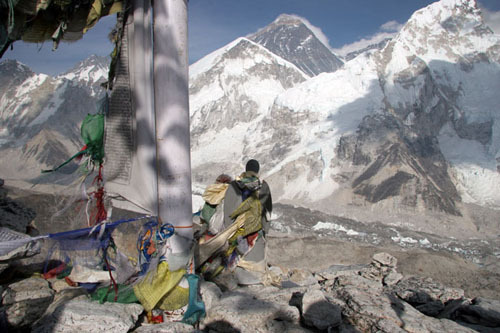 Inhaling the particulate results in something known locally as the Khumbu cough. 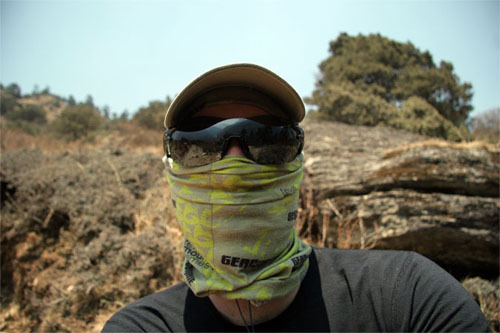 Instead of a mask, I wore a Buff scarf pulled up over my face. The thin Buff fabric did a good job filtering dust, though it was often too warm and would fog my sunglasses if I breathed too much out of my nose. continued on next page. . .